Expansion or control joints should be installed in both the structural slab portion and the protection layer. Providing for expansion only at the structural portion does not allow for thermal or structural movement of the topping slab. This can cause the topping slab to crack, leading to membrane deterioration. Refer to Figs. 3.62 and 3.63 for proper detailing. Membranes should be adhered only to the structural deck, not to topping layers, where unnecessary stress due to differential movement between the two layers will cause membrane failure. FIGURE 3.62 Expansion joint detailing for topping slab construction. FIGURE 3.63 Expansion joint detailing for topping slab construction. Waterproof membranes should be adequately terminated into other building enve- lope components before applying topping and protection layers. The topping is also tied into the envelope as secondary protection. Control or expansion joints are installed along topping slab perimeters where they abut other building components, to allow for adequate movement (Fig. 3.64). Waterproof membranes at these locations are turned up vertically, to prevent water intrusion at the protection layer elevation. Refer to Fig. 3.65 for a typical design at this location. FIGURE 3.64 Perimeter expansion joint detailing for sandwich-slab membranes. FIGURE 3.65 Transition detailing for sandwich-slab membranes. When pavers are installed as the protection layer, pedestals are used to protect the membrane from damage. Pedestals allow leveling of pavers, to compensate for elevation deviations in pavers and structural slabs (Fig. 3.66). At areas where structural slabs are sloped for membrane drainage, pavers installed directly over the structural slab would be unlevel and pose a pedestrian hazard. Pedestals allow paver elevation to be leveled at these locations. Pedestals are manufactured to allow four different leveling applications, since each paver typically intersectsfour pavers, each of which may require a different amount of shimming (Fig. 3.67). If wood decking is used, wood blocking should be installed over membranes so that nailing of decking into this blocking does not puncture the waterproofing system. Blocking should runwith the structural drainage design so that the blocking does not prevent water draining. Tile applications, such as quarry or glazed tile, are also used as decorative protection layers with regular setting beds and thin-set applications applied directly over membranes. With thin-set tile installations, only cementitious or liquid-applied membrane systems are used, and protection board is eliminated. Tile is bonded directly to the waterproof membrane. Topping slabs must have sufficient strength for expected traffic conditions. Lightweight orinsulating concrete systems of less than 3000 lb/in2 compressive strength are not recommended. If used in planting areas, membranes should be installed continuously over a structural deck and not terminated at the planter walls and restarted in the planter. This prevents leakage through the wall system bypassing the membrane. See Fig. 3.68 for the differences in these installation methods. Figure 3.69 represents a typical manufacturer detail for a similar area. FIGURE 3.68 Planter detailing for split-slab membrane. FIGURE 3.69 Typical detail for planters on decks. Using below-grade membranes for above-grade planter waterproofing is very common, especially on plaza decks. While these decks themselves are often waterproofed using the techniques described in this chapter, the planter should in itself be made completely water- proof to protect the building envelope beneath or adjacent to the planter. 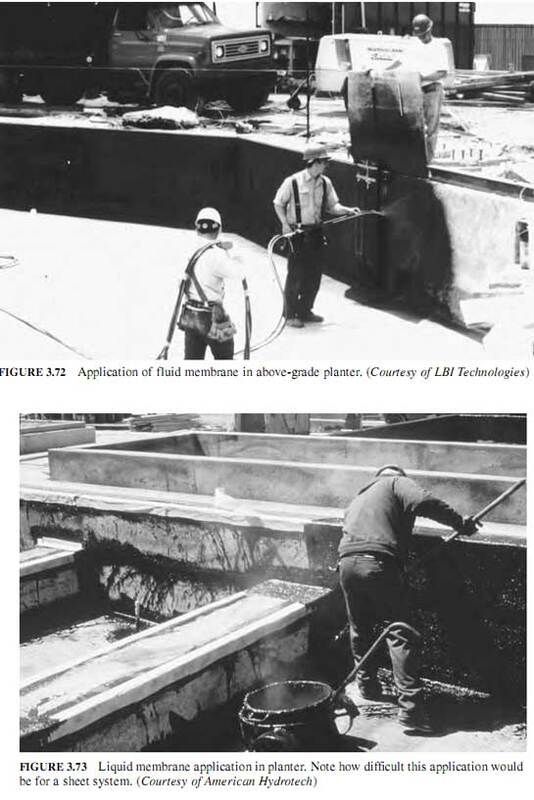 Figures 3.70 and 3.71 detail the typical application methods of waterproofing above- grade planter areas. Note that each of these details incorporates the use of drainage board to drain water towards the internal planter drain. Since these areas are watered frequently, drainage is imperative, in this case, not only for waterproofing protection but also for the health of the vegetation planted in the planter. FIGURE 3.70 Typical detailing for above-grade planter areas. FIGURE 3.71 Typical detailing for above-grade planter areas. Figure 3.72 shows the application of liquid membrane to planter walls as does Fig. 3.73. In the latter note how difficult the use of a sheet good system would be in this particular application. Whenever waterproofing above-grade planters with tight and numerous changes-in- plane or direction, liquid applied membranes are preferred over sheet-good systems as the preferred “idiot-proof” application. The con- tinual cutting of sheets in these smaller appli- cations results in a corresponding number of seams that emphasize the 90%/1% principle. Liquid applications are seamless and can prevent the problems associated with sheet-good installation in small planter areas. Selection of a protected system should be based on the same performance criteria as those for materials used with below-grade applications. For example, cementitious systems are rigid and do not allow for structural movement. Sheet-goods have thickness controlled by premanufacturing but contain seams; liquid-applied systems are seamless but millagemust be controlled.